Posted by Andrea H at 10:00 am, January 13th, 2014 under American, BBQ, Truck, You Got Smoked Truck. 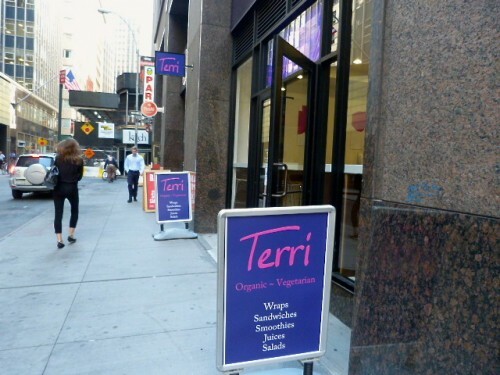 Posted by Andrea H at 11:30 am, October 3rd, 2013 under BBQ, Financial District, Sandwiches, Terri, Vegan, Vegetarian. If you are a long time reader of this blog, you might have noticed that I kind of like spicy food. A lot. 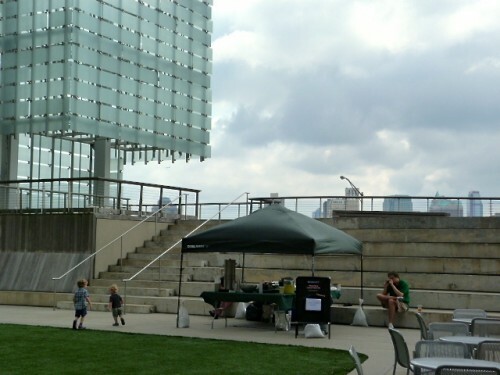 When I ordered a sandwich from the Route 66 Smokehouse pop up on the Elevated Acre (above 55 Water St. btw. Old Slip & Coenties Slip) I was not expecting an assault of pepper so crazy that my nose was running the entire time I was eating. That being said, I think with a couple of tweaks we can get a little excited about the food at the forthcoming Route 66 brick and mortar. Posted by Andrea H at 10:00 am, September 4th, 2013 under American, BBQ, Financial District, Route 66 Smokehouse, Sandwiches. 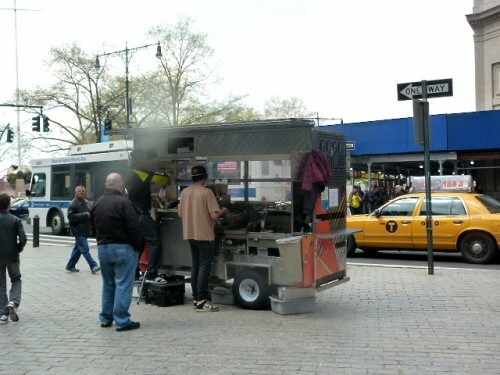 Posted by Andrea H at 10:00 am, April 24th, 2013 under American, BBQ, Cart, Financial District, GoGo Grill Cart, Sandwiches. 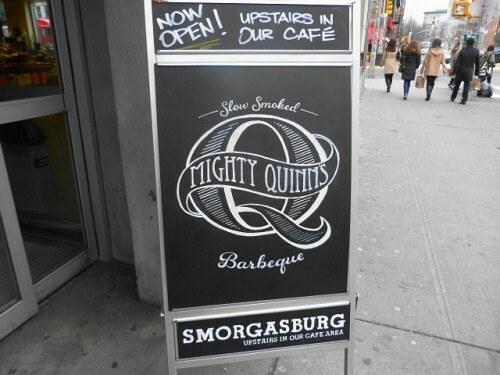 When word came of a pop up in Downtown Lunch territory from Smorgasburg barbeque favorite Mighty Quinn’s, I put it on my “to eat” list. It wasn’t on there for long as I hit it up late last week to try it out before the BBQ purveyor is replaced at the beginning of February. It’s a short menu on offer, but if you like smoked and barbequed meats, you may want to walk a couple of extra blocks for lunch. Posted by Andrea H at 10:00 am, January 14th, 2013 under BBQ, Mighty Quinn's, Sandwiches, Whole Foods. I don’t know when you can tell if the NYC truck scene has reached saturation of a certain kind of food, but I feel the BBQ meats in taco and slider form is almost there. 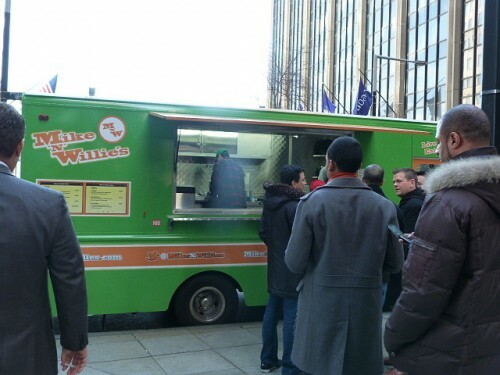 A couple of weeks ago, Mike ‘N’ Willie’s truck entered the fray, following in the footsteps of Mexicue and Korilla BBQ. I know that nearly all of us love a good taco or BBQ stuffed in a bun, but how are we to know which truck to spend our hard earned money at? I headed over to Mike N Willie’s when they parked in the FiDi the other day to check out their abbreviated menu. Posted by Andrea H at 10:30 am, February 6th, 2012 under BBQ, Mike N Willie's Truck, Seafood, Truck. 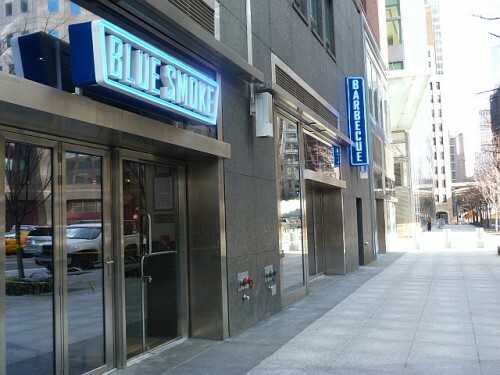 If you’re a fan of barbequed meats and have been eyeing the new Blue Smoke in Battery Park City, but don’t have time to go sit down and eat lunch there, that problem should be solved next month. I stopped by yesterday and asked when they would be starting takeout and was told “sometime in February.” There’s not an exact date set, apparently, but at least it’s happening in the next few weeks. There’s also a bake shop counter up front with cupcakes and various things like cookie pie for sale, if you’re so inclined to a mid-afternoon sugar hit. Unfortunately the Blue Smoke website is down, so I can’t show you the lunch menu but there are pulled pork sandwiches along with a burger for about $12 which is about as cheap for quality BBQ as we can ask for. I’ll keep you posted if word comes that the takeout operation is up and running. 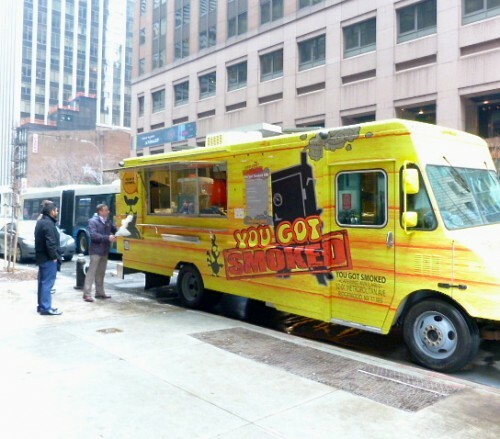 Posted by Andrea H at 11:00 am, January 31st, 2012 under Battery Park City, BBQ, Blue Smoke.